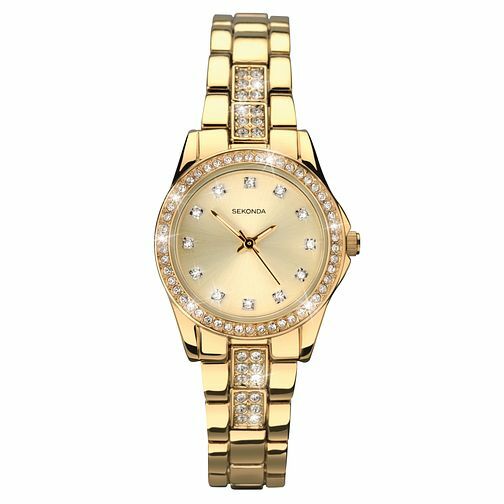 Shimmer and sparkle with this stunning yellow gold plated ladies' Starfall watch from Sekonda. Featuring a luxurious champagne coloured dial and dazzling stones set on the dial, case and bracelet, go for glamorous opulence with this chic timepiece. The perfect finishing touch for a striking evening look. Sekonda Ladies' Starfall Gold Plated Stone Set Watch is rated 5.0 out of 5 by 1. Rated 5 out of 5 by Anonymous from Looks lovely Looks lovely and looks more expensive than it is. Made a brilliant birthday present. Would definitely recommend.